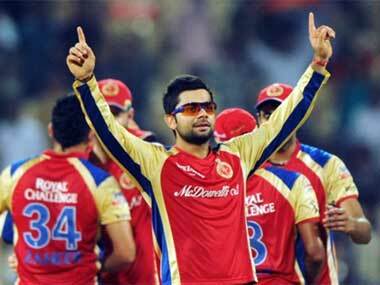 Live scores and updates of 2nd match of the IPL between Delhi Daredevils and Royal Challengers Bangalore. FirstpostYuvraj Singh has been struggling of late but Kohli has a lot of faith in him and feels that he will be the X-factor for the team this season. Meanwhile, Yuvraj has said that it's not easy to overcome World T20 final disappointment. FirstpostYuvraj Singh said it was difficult to cope with the World Twenty20 final defeat against Sri Lanka but he was learning to take disappointments in his stride. JP Duminy is the new batsman! DD are 17-3 with MVijay 9*(11). A wicket-maiden from Varun Aaron to start off with. DD need a partnership here. FOUR! Poor fielding from Starc, Vijay flicks it to short fine leg where Starc makes a mess of it, dives over the ball and it races away to the fence. FOUR! Lovely shot to get off the mark. Duminy drives it straight back past the bowler & it whizzes away. 13 runs off the 6th over, a good one for DD. 30/3 after 6 overs! Alan Donald says that Gayle has a bit of a back problem hence missed out in this match. It's the strategic time-out, DD are 35/3 after 7 overs. Vijay and Duminy would look to up the ante after the break! Chahal into the attack now. Ross Taylor comes out to the middle and is greeted by a googly, he is bamboozled and somehow manages to defend it. The very next delivery is a perfect leg-spinner. Taylor looks to defend but misses. An outside edge to short third man off the next ball for a single, brilliant bowling from Chahal. Just short of the keeper! Varun Aaron is gathering good pace here. Short on middle, Duminy goes for a pull but is done in by the extra pace, gets a top edge which falls short of the keeper. Just 4 runs off the 9th over, it's getting more and more difficult for DD. They need something special from Duminy and Taylor here. They have been in good form coming into the tournament. Ah! Just over the head of Chahal! It was a googly, Duminy uses his feet and looks to clip but gets a leading edge over the head of leaping Chahal for a couple. @whathappendtogayle: He has a back injury apparently. FIVE WIDES! Drifted down the leg side, it keeps very low, Duminy misses his nudge, the keeper too misses it and it runs away to the fence. 9 runs off the 10th over, DD 49/4! Ashok Dinda into the attack for the first time. 50 comes up for DD and it has taken them 10.1 overs!! Duminy bowls a fine over - very tight line and only 5 off it. Much better from Nadeem - it's a much more controlled over and Parthiv and Kohli settle for a few singles here and there. RCB comfortable. Rahul Sharma in to bowl - time for fast, skidding leg-spinners. RCB need 86 from 72 balls. What is that? Shami aims for Yuvraj's helmet and the lefty just tries to protect himself with the bat - and gets a lucky four for it. SIX!! Yuvraj with a low, hard six over mid-wicket - RCB want to finish this one early. Need 70 from 58 now. Yuvraj with a show of frustration as he attempts a late-cut off Neesham - that was flirting with his own wicket and he probably realises it. And FOUR! He stands his ground and smacks it over mid-wicket again for four. That should return some confidence in him. There was an appeal for dead-ball as the ball hit the spider-cam on the way to four — that doesn't happen to often does it. Four stands. 12 overs gone and RCB need 60 from the eight overs. Kohli and Yuvraj in the middle.